Why Install a Commercial Rooftop Unit? We are going to start this post out by saying that we think all homeowners should have a basic understanding of how it is that their home cooling systems work. This basic understanding in no way suggests that you should ever attempt to service your air conditioning system on your own! When you need AC service, for the capacitors that we are talking about today or otherwise, call in the pros. Okay, now that that’s out of the way, on to today’s topic. The capacitors in an air conditioning system may not come up in conversation all that often, but they do play a vital role in the operation of your AC. 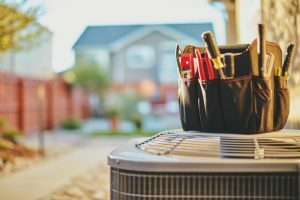 Considering the vital role that your AC plays in your day to day life throughout the cooling season, you’d better believe that they should be of concern! Today, our Plainfield, IL HVAC pros are here to help you better understand just what it is that these capacitors do. Capacitors are electronic components used in a whole lot of different systems, and in a lot of different ways. They may be used for power storage, for instance, or to smooth out power levels. Or, heck, for both! This is sort of the case with your air conditioning system. While capacitors may be combined into single units, and while different types of capacitors may have some technical differences, we’ll be talking generally about two different types of capacitors—the start capacitor and the run capacitor. When you are bicycling up a hill, what’s more difficult: Continuing the ascent uninterrupted, or stopping in the middle of things for a swig of water and then starting up again from a dead stop? The latter, of course. The same is essentially true when it comes to running your air conditioner. It takes a little bit of extra oomph to get the system going, as opposed to keeping it running. That is where the start capacitor comes into play. It provides the extra torque required to get your system up and running. Of course, once it is, the matter of keeping the system running comes into play. So, want to take a guess as to what the run capacitor does, then? You got it—it keeps the system running once it’s running! Why might you need such a contraption, though, if the hard part is getting the system started? Well, the current running through your air conditioning system is not always constant, but—it kind of needs to be! The run capacitor simply helps to level out the power running through the system in order to keep it running reliably and consistently. As you can imagine, trouble with your capacitors could result in a number of different problems. You could wind up with a system that won’t start. Or that hard starts. Or that short cycles. All of these issues put your comfort, cooling efficiency, and the condition of your AC at risk. Schedule your air conditioning services with DuAll Heating & Cooling.